I have blogged about numerous NeoCell products. I happen to love the brand. Their products are great. The quality is excellent and they make products that work. I happen to have severe osteoarthritis in my knees at the young age of 45. It is hereditary and there is nothing I can do about it. I have it in my back too. I have been to an orthopedist and he has told me I am too young to get joint replacement surgery. Boo! My knees hurt like hell. Plus I am overweight and need to lose weight so that they will not hurt as much. So I have joined a gym with a pool to start swimming so that I can do water aerobics and try that. I happen to hate swimming. But what is one going to do? I have to lose the weight and do exercise that is good for my joints. I already take pain meds for my back, which has a 4 level vertebral fusion and for a tumor that was on the sheath of my femoral nerve and left me with permanent nerve damage on that nerve. It left me feeling like I have electricity going down my leg all the time. So I have limited mobility and cannot stand for very long. You do not want to be in front of me in line. I get cranky. 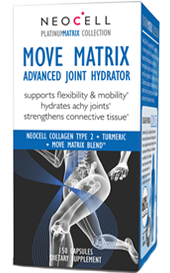 The woman from NeoCell told me about Move Matrix. She said she takes it for her arthritis and that is is an amazing product. I said I'll give it a shot, what harm can it do. Let me say that I was able to pretty much stop taking my naproxen while on this supplement. That is HUGE. Very good. I am very happy with the results of this month on Move Matrix. As you can see, it contains a good number of items in it that doctor's recommend for joint health. It even contains the ingredient I was going to get in a shot for my knee, hyaluronic acid. The shot was going to be $600 and I was going to have to pay $200 per knee every 6 months. And you can only get so many of them. The shots of hyaluronic acid are great for the knee, they help take away the pain, but apparently so does the capsules with the hyaluronic acid in it too! I just cannot believe how well the capsules work on my osteoarthritis. Mine is very severe too. You have to take 5 capsules per day. That seems like a lot but when it comes to pain relief, I will take the recommended amount. It is definitely worth it. You can take all of the capsules in the morning, or take them at various intervals throughout the day. like pain medicine. I take mine all in the morning. The NeoCell Move Matrix capsules comes in a jar of 150 capsules for 1 month of use. They are $24.95 per jar. The capsules can be purchased at GNC, Whole Foods, Vitamin World, Sprouts, Mother's, pure formulas, co*op, The Vitamin Shoppe and Better Health. Check the store locator to look for a store near you. Like Neocell on Facebook: https://www.facebook.com/NeoCellCollagen; Follow Neocell on Twitter: @NeoCellHealth; Follow Neocell on Instagram: http://instagram.com/neocell/; Subscribe to Neocell on YouTube: https://www.youtube.com/user/neocellcorp?feature=CAQQwRs%3D and Follow Neocell on Pinterest: http://www.pinterest.com/neocell/.